There are several diagnostic modalities available for the evaluation of patients with stab wounds to the anterior abdomen. Those most commonly employed are physical examination, DPL, and local wound exploration. Physical examination may fail for all the reasons stated in the aforementioned discussion on use of physical examination in patients with blunt trauma. Accurate physical examination may be difficult if patients are intoxicated with either drugs or alcohol. Furthermore, retroperitoneal injury or tenderness from concomitant blunt trauma may produce abdominal tenderness in the absence of intraabdominal injury. Thus a single physical examination may be misleading much of the time. Serial physical examinations, on the other hand, have been shown to be accurate in the evaluation of patients with stab wounds to the abdomen. 14 This must be considered with all the provisos mentioned in the discussion on blunt trauma. Closed percutaneous DPL, as described earlier, is an excellent technique to evaluate patients with anterior abdominal stab wounds. 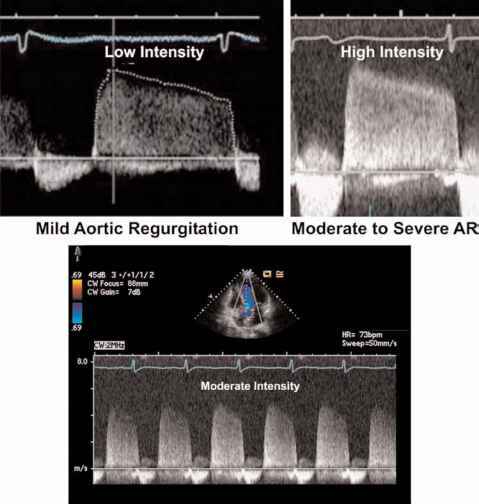 It is performed exactly as described previously for patients with blunt trauma. There is some controversy as to which level of red cells constitutes a positive DPL when used for stab wounds. There is a linear relationship between lavage count and rates of nontherapeutic laparotomy and missed injuries. Thus the lower the threshold for a positive lavage cell count, the higher is the rate of nontherapeutic laparotomy, but the lower is the rate of missed injury. If the threshold for a positive lavage count is set higher, there are fewer nontherapeutic laparotomies but more missed injuries. Most centers set between 10,000 and 20,000 red blood cells/pL as a threshold for laparotomy in patients with stab wounds. The accuracy increases from approximately 78 to 90 percent as the threshold for positivity decreases. 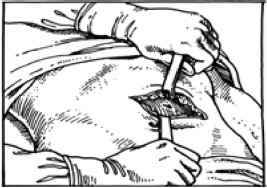 Any patient who undergoes DPL must be observed in the hospital for at least 12 to 24 h.
Local wound exploration is a superb way to evaluate the abdomen after a stab wound ( Fig, 2.5.2.-5). It is important to remember that this is a surgical procedure and must be regarded as such. This requires good lighting, proper instruments, and an acceptable level of local anesthesia. Often this must be supplemented with intravenous conscious sedation. Digital probing of the wound or radiographic trajectograms with contrast material should be mentioned only to be condemned. These are completely inaccurate and lead to a very high rate of both nontherapeutic laparotomy and missed injuries. FIG. 252-5. Local wound exploration. Local wound exploration is the appropriate way to evaluate the abdomen after a stab wound. This is a surgical procedure requiring expertise, proper instrumentation, and lights. It is an appropriate diagnostic technique only for patients with anterior abdominal stab wounds. The stab wound is widened and explored down to the level of the fascia. A determination can be made whether the anterior fascia and/or posterior fascia has been violated. If local wound exploration demonstrates no violation of the anterior fascia, the patient can be discharged home safely. If local wound exploration demonstrates clear violation of the fascia, several options are available. It is entirely reasonable to explore these patients because the rate of nontherapeutic laparotomy will be relatively low. On the other hand, if one wishes to absolutely limit the number of nontherapeutic laparotomies, positive local wound explorations can be followed by DPL. If DPL fluid exits the wound or is positive by cell count, the patient should then undergo laparotomy. Perhaps it is most important to realize the limitations of local wound exploration. It is often difficult to follow the trajectory of a stab wound. If the clinician is not completely comfortable that this has been a technically satisfactory procedure, one must abandon the use of the local wound exploration in that patient and use another form of evaluation. Our preference would be to use DPL if the local wound exploration is not considered technically satisfactory.